Start a sale for the customer as normal. On the Payments toolbar, click Account. If necessary, click the magnifying glass icon next to Purchaser and search for the appropriate customer who is purchasing the item(s). Check Display Purchaser Shipping Address on Invoice if the purchaser information should display on invoices. In the Terms field, enter the payment terms for the transaction. 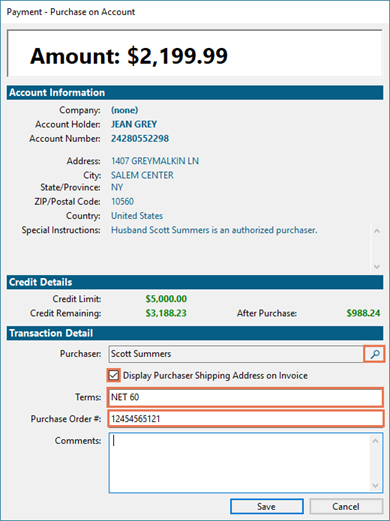 In the Purchase Order # field, enter a purchase order number, if required for charges. In the Comments field, enter any additional notes about the transaction.